Mexican born, raised, and residing. 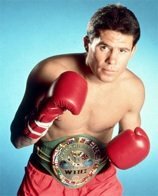 Retired boxing champ Julio Cesar Chavez deserves his place on our list of famous people of Mexico, as he is considered one of the greatest boxers of all time. Career statistics: 108 wins, 6 losses, 2 draws & 87 knockout wins. Fought 37 title fights. Sons: Omar and Julio Jr. are boxers too, Julio being the more successful of the two.